A burglar breaks into Airi’s house, but she chases him out by throwing vases at him. He does manage to steal a valuable dolphin statue, but drops it after getting caught up in a fight between Yamame and Hotaru. Burumaru finds the statue and takes it. When Mamoru finds out that the statue was stolen from Airi and that his dog now has it, he decides to sneak back in the house to return it. Airi’s installed a new security system though, so he has difficulty doing so. Eventually he returns it, but gets ejected out. Mamoru’s mother thinks he should get revenge for being ejected, so she gives Mamoru a diamond that she stole from the house and has him return with it. Yamame and Hotaru decide to go with him, but quickly get ejected. Soon, Airi accidentally spills orange juice on her control system, which causes it to malfunction. Yuuna, who was sleeping over, got up to go to the bathroom and is now in danger from the out-of-control security system. Mamoru is able to save her though. Next, he defeats Airi’s guard robot by unplugging it. 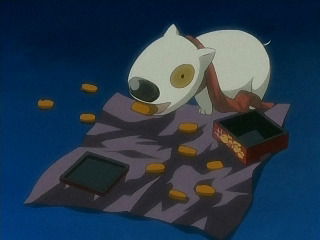 He than goes to return the diamond and also grabs Airi’s diary. He’s ejected again due to an explosion. Mamoru reads the diary and learns that Airi is mean to someone that she has feelings for. 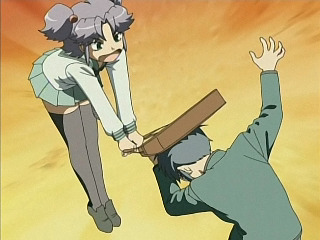 The next day, he secretly returns the diary by stuffing it in Airi’s bag when she uses it to hit him over the head. Airi is later seen putting a picture of Mamoru into the diary. Gah! I did it again and wrote too much. I really have to stop going overboard or my entries will be as long as they used to again. I don’t have time for that. Getting on topic, this was a fun episode. Airi sure is rich. She got such a ridiculous security system installed quickly. It was pretty stupid of her to put a plug on her robot though. She might be able to actually keep out intruders in the future if she avoided silly mistakes like that. I’m starting to like Airi. Tsubaki still wins for my favorite tsundere in this show (what the heck was she doing this week? XD) but Airi has great tsundere skills. Plus, she gets significantly more screen time. Come on Tsubaki. Show up more! As a somewhat off topic (again!) note, what exactly does “ventora” mean? 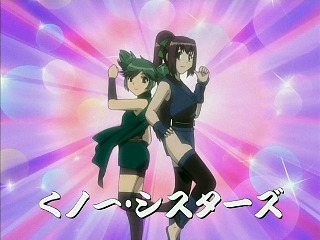 After seeing next episode’s preview and episode 7 of To Heart 2, I know it has something to do with aliens. It’s not in my dictionary though, so it just annoys me. Okay, I was wrong. 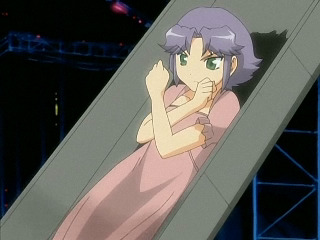 The girl is on a slide, not in a casket. I guess I hang around with morbid people so I thought death.